Do you ever reflect on the knowledge that you can receive restorative dental care when something goes wrong? Does this lead you down a complex rabbit hole, leading you to the sudden thought that perhaps caring for your oral health is a complete waste of time? Why brush and floss when you can avoid dental hygiene sessions and then visit us for repairs? Actually – it’s a bit more complex than this. As you likely know, we suggest that you brush your teeth every day (two times, that is), floss your smile once daily, and schedule a time to see us twice a year for an exam and cleaning. The more you remain consistent with this method, the longer your teeth remain whole and healthy. If your smile is free of problems like tooth decay or infection and your teeth are undamaged, your nerves will remain unexposed, calm, and comfortable. As a result, you won’t need to worry about problematic sensitivity or discomfort. Keeping your oral health in good shape means you will enjoy a smile that functions successfully and feels just fine. Let’s say you take great care of your oral health – you will need to spend money each year on toothbrushes, toothpaste, dental floss, and two preventive care visits. Now, let’s say you avoid caring for your smile – the cost of your restorative care treatments will exceed the cost of prevention (which you will continue to require even if you receive restorations). Keep your wallet full by protecting the well being of your smile. 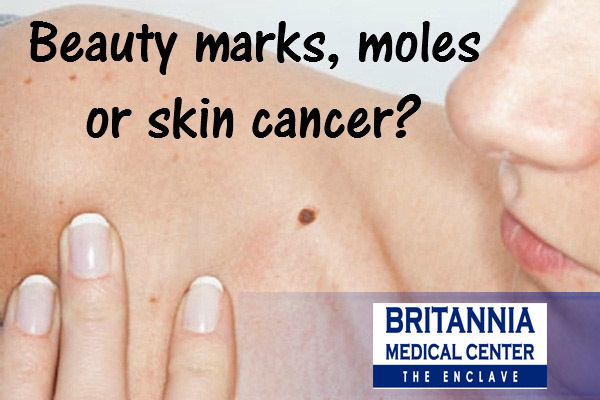 Beauty marks, Moles or Skin Cancer? Moles which are cancerous tend to pose a serious threat especially if diagnosed late without taking advantage of proper treatment options. It is however very important to understand the fact that not all moles are cancerous though all normal moles can turn to be cancerous in the long run especially when the skin is overly exposed to the UV rays from the sun. As an adult, in the event that you notice that the number of moles on your skin is increasing, you should take precautions since moles rarely grow during adulthood. Failure to do might easily lead to cancer of the skin. First off, these type of moles are usually pink, brown and tan like. They also tend to appear flat and smooth sometimes raised. Some may look flat in the beginning and then elevate eventually. Take note, moles which are normal tend to be oval in shape or in some cases circular. Remember, cancer moles are completely different from normal moles both in terms of color, shape, size and appearance. Height – these moles tend to be overly elevated and quick to change in size. Taking this into consideration, in the event that you start to notice any increase or decrease in the diameter, color or shape of the mole or in case it starts to bleed, you should immediately consult a medical specialist. Size – the average size of any more is 6mm on average. You should therefore have your mole checked by a doctor in case it seems bigger than normal. Asymmetry – moles tend to look alike even when they are divided. Picture this, you divide the mole into two equal parts and then make a comparison. In case you notice that the two look different. Consult your dermatologist immediately. Shade – normal moles have the same color throughout. Taking this into consideration, any mole which has varied colors should be treated as very suspicious. Take note, a scalp of moles which is cancerous can easily have different shades such as brown, red, black etc. this symptom is quite striking hence should always be addressed immediately. In case you have a history with moles then it is strongly advised that you carry out a monthly check on your body. Remember, moles on the back are very common amongst males while moles on the lower section of the body have been found to be common in women. It is however recommended that you check the whole body especially after taking a shower or whenever your skin gets wet. In the process of checking, it is strongly advised that you closely check on regions such as the armpits and neck as well as the back of the knees. Removing a tissue is done for the purpose of testing. This is clearly evident from the fact that when a mole is detected as having been cancerous then the dermatologist would go ahead and get rid of the entire mole from the affected area. Almost all skin cancers are curable if diagnosed early. So if you notice changes in your skin, it is worth looking into. You should be doing a monthly skin cancer self-exam, and better still you can always snap a pic of a mole or mark each month to note any changes. You should be doing a monthly skin cancer self-exam, and better still you can always snap a pic of a mole or mark each month to note any changes. Plan to make an appointment with a dermatologist and finally get these moles and marks checked out.